The Schwalbe Marathon has been a stable of touring cyclists for many years. It has a great reputation as a hard wearing and reliable tyre. New for 2011, the "Greenguard" version of the Marathon is a redesign which brings a greater level of puncture resistance, better suitability for electric bikes, and even greater endurance than its predecessor. The green coloured puncture resistant Greenguard layer is 3 mm thick and made of 1/3rd recycled latex. This tyre is still not quite so puncture proof as the Marathon Plus, but it does have advantages. 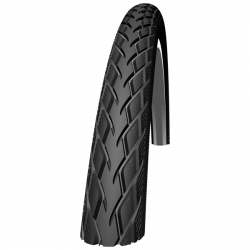 It's still a very good and puncture resistant tyre, it's a bit less expensive and it's available in more sizes, including to fit folding bikes and trailers. Judy has Schwalbe Marathon tyres on her touring bike. I have them on my folding bike and have used them for commuting and touring. 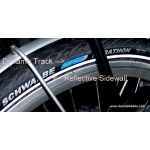 The Schwalbe Marathon has both a reflective sidewall for safety and a dynamo track to optimise working with a dynamo lighting system. In many sizes (including the most common: 37-622) this tyre is approved for e-bikes at up to 50 km/h.